People of talent and accomplishment, people admired and happy and sound of mind, have been committing suicide in surprising numbers. When Jane seeks to learn why she becomes the most-wanted fugitive in America. Her powerful enemies are protecting a secret so important so terrifying that they will exterminate anyone in their way. I had an ultimate fangirl moment when I saw that The Silent Corner was available for review on NetGalley. See, I am a huge Dean Koontz fan. Huge. I started reading his books in my sophomore year of high school, Ticktock was the book, and I was hooked. I have read every single book of his up to The Husband. Then I stopped. I had two children almost back to back, moved 3 times and honestly, didn’t have the time to read. In 2011, I got my first Kindle and started reading again. I missed reading his books (mine got lost in one of the moves we had). So when I saw The Silent Corner for review on NetGalley, I applied. I was not expecting to be selected and when I got the email that I had been selected, I got up and did a happy dance. I wasn’t disappointed in The Silent Corner. It was everything that I have come to expect from his books. Plenty of intrigue, action and a hint of paranormal. From the beginning of the book, I was hooked in because I had to find out what Jane was doing and how she was going to do it. Believe me, when a book does that to someone, it is worth reading and keeping (I am talking my SO into buying me the hardcover when it is published). From the opening scene to the end, which was really creepy, I was kept on my toes. You never knew where the story would end up or what Jane would do. I loved it. Normally, I don’t like it when the author plays mind games or switches to other characters point of views. But in this book, it worked and it helped build the story up to the climax and when the two main storylines intertwined. What I liked about this book is how realistic it was. What was happening to these people on that scientist’s Hamlet list….that could happen. It is possible that some nut with a God complex could design something like what is outlined in the book and then use it in the same way. As with all of his other books, there is a hint of truth running through it and it makes you think….what if?? Could it really happen?? The end of the book was pretty intense. All of the storylines were brought together in a way that ended all but the main one. Doing that also left the book wide open for book 2….which I will be waiting with bated breath to come out. I’m a Koontzaholic! 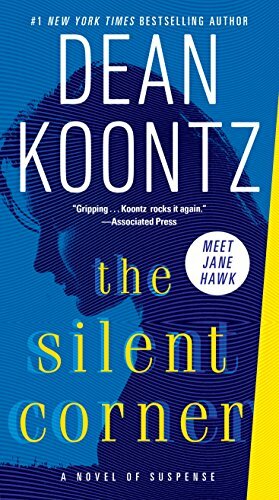 So jealous you got to read ‘The Silent Corner.’ After reading your review, I’m practically bursting with enthusiasm to get a copy in my hands as soon as I can. Thanks for sharing your thoughts and letting me know that Dean still has the goods to deliver a great read.